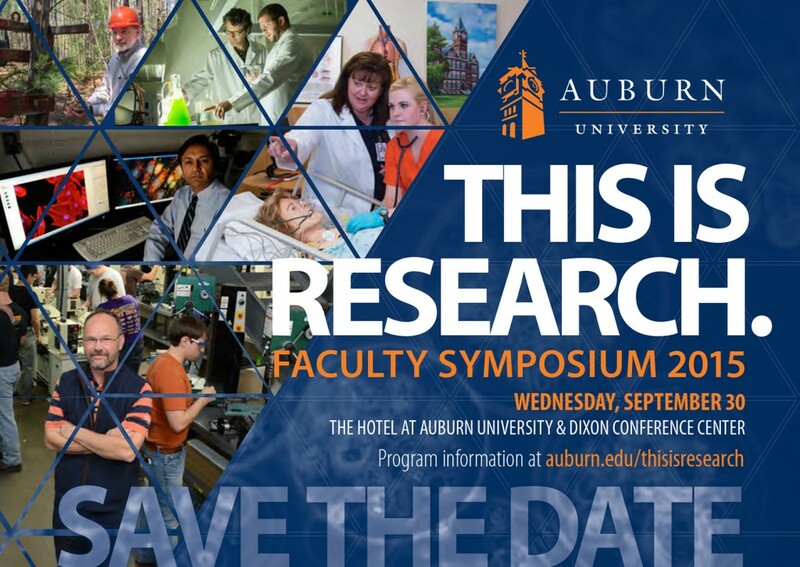 Auburn University will launch its new “This is Research: Faculty Symposium 2015” Sept. 30 at The Hotel at Auburn University and Dixon Conference Center to recognize research excellence of Auburn and Auburn Montgomery faculty. The event is designed to showcase faculty research, provide a forum for collaboration, offer information about support offices on campus and increase the visibility of Auburn research to external constituencies, such as advisory board members, representatives from industry and foundations as well as community members. Three-minute, morning lightning presentations will cover cyber, energy, health disparities, military-related research, SENCER, applied design, STEM education, climate-earth systems, digital applications, fMRI research, nano-bio research, omics and informatics, and data management and digital scholarship; and additional areas may be added as well. A morning research expo will provide information about key research support offices on campus. Fourteen Auburn researchers from across campus will present 10-minute Auburn Talks about their work. The list of presenters and titles is available on the This is Research website (https://cws.auburn.edu/OVPR/pm/thisisresearch/auburntalks). The afternoon will also have one-on-one sessions to allow attendees to visit with researchers in areas of health, energy, environment, cyber and technology. Another afternoon session will have updates from directors of Auburn’s institutes, centers and initiatives. The evening portion of the program will include the presentation of the Auburn University Research Advisory Board’s Advancement of Research and Scholarship Achievement Award, followed by the keynote address by Lt. Gen. Steven Kwast, commander and president of Air University at Maxwell Air Force Base in Montgomery. A reception for all attendees will conclude the event. The “This is Research: Faculty Symposium 2015” is one of two This is Research symposia scheduled for the upcoming school year. A spring event, “This is Research: Student Symposium 2016,” will be held in April in the Student Center. The two symposia replace the former Research Week which concurrently showcased faculty and student research. In 2016 a biennial part of the faculty symposium, “Showcasing the Work of Creative Scholarship,” will debut with feature exhibitions and performances. More details on the 2015 symposia are available on the This is Research website at www.auburn.edu/thisisresearch. For more information, contact Jennifer Kerpelman at kerpejl@auburn.edu.